Discussion in 'Audio Hardware' started by Arkdog, Oct 9, 2018. Let me start by saying that I've dreamed for most of my adult life to have a record player and vinyl. I'm finally of an age with a bit of disposable income, and a drive to do it. I adore music, and I've long lurked this forum seeking answers, or advice. Personally, I have my eyes on a Rega Planar 3 (and I'll certainly go there shortly), but in sharing this journey with my girlfriend, I've managed to acquire 2 record players that need resolution. One, an old Harman Kardon ST-7 - I've taken this to directly to a specialist repairer, as all the research I've done leads me to believe I'm in well over my head with that one. The second is a Denon-DP200. Simple little table, no frills, and I'm not even sure Denon makes them (rebadges I assume?). When connected to any sort of amp (a Denon AVR-X500 for example) I hear muffled/raspy sound reproduction, but no tracking issues. I've replaced the stylus... identical issues. I've tried using another amp... same issue. I've played the record on another turntable (a crap little portable numark PT01 that my neighbour had in his closet) with the same amp... no issues - so not the record or amp. So assuming it's the player, and the tone arm on these sorts of players seem quite fixed - what else could this be? Power? Level of the table? Can this be something I can solve myself (I'm capable of fiddling if required). Seems a bit crazy to be taking this kind of table to a specialist. It's my understanding that that record player, hooked up to some sort of bose home entertaiment system (I think it was a Bose V35 was functioning perfectly only 8 months ago (before being packed up and put in storage). I've tried searching, and lurking for a week now to find solutions amongst other forums and thread, but I'm simply confused. If I had any hair left I would have pulled it out by now. Musical Maxis Is out there.......somewhere? SoundDoctor and Leonthepro like this. Are you running the turntable output through a phono stage (often called a pre-amp)? I think the Denon has one built in. Is it switched to "line" or "phono"? You want "line". This activates the phono stage. The numark you used has one too, but there's no switch to turn it on and off, it's always on. Leonthepro and Musical Maxis like this. Touché my friend. I never even considered that! My bad. Thanks for the response gang. The Denon DP-200 has a switch for phono-stage "on" & "off". OFF : When connecting to a PHONO input terminal. 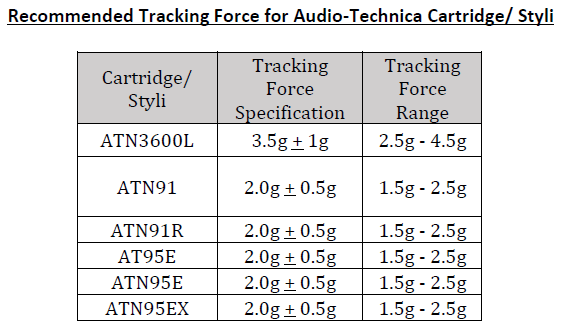 I'm not running a pre-amp, and my Denon AVR-X500 does not have a phono input as far I'm aware (http://www.audiocentre.co.id/product/652/3/x500b.jpg) - I'm going straight into "DVD" there. So I'm assuming I'm using the in-built pre-amp of the turntable, thus it's switched to "On". Switching it to off, give me a very very weak sound out of the receiver/amp. Could be tracking force (tone arm could have taken a knock in transport). Stylus looks properly seated in the cartridge. Cables seem fine, and as mentioned, the exact same set-up with some bose entertainment system was working only 8-10 months ago. I'm feeling like a tone arm issue might the cause or some connection between stylus and cartridge? I just felt turntables like this Denon where very "plug and play", and thus might not have suffered from tone arm arm issues, or cartridge/stylus connection issues? FYI - I really hate being so crap at this, yet I can pull apart a computer into a thousand pieces and chips/wires etc. and put it back together with my eyes shut. Seems like it comes down to some installation error or the wiring in the arm. Have you checked the tracking force? That Denon is basically an AT LP60 which most members here are more familiar with, from previous threads if nothing else. It has an AT 3600 cart with a Denon label. That's all at the lower end of tt and cart lines, but it is not bad, it is basic acceptable starter gear and should sound ok for a start. There are many youtube videos with the LP60, and you can see and hear that it is essentially or exactly the same machine and has ok sound. It's clearly better than that Numark - the turntable mechanism is much better and the AT 3600 cart is MUCH better than the cart on that Numark. My first guess from what is written here is the cart itself has been damaged somehow. It can be replaced inexpensively. Only the AT 3600 (aka AT91) will fit that arm. If someone can get the cart out and test the cart on a different, good working system, (which could take using some putty to stick it to a standard headshell for the test) that will narrow down if it really is the cart. If so, replace it. IMO if it's something else, move on to your Rega or other. The HK (Rabco) is a well known money pit. It's fascinating and great if you get it working, until it breaks again in one of 25 ways. It is for masochists only. Shak Cohen, McLover, Leonthepro and 1 other person like this. "Rewarding" in the sense of "emptying your bank account". Well... I've already assembled a collection of records (without a player) over the last 18 months that lives at my neighbours house. I'm being very, very patient - but that Rega Planar 3 is on the horizon! uzn007 and Chris Schoen like this. you will play them on over the years. uzn007 and zombiemodernist like this. Thank you mate! This is great advice. I'm assuming I should be using "LP60" as my search term for future support on this guy (rather than Denon DP200). I'm thinking it's probably good to get it working (I'll find a cartridge) as it can be a back-up for the Rabco, as both will be sitting with my Girlfriend - meanwhile, I'll keep my eyes set on the Rega. I'm guessing before I order a cartridge, I should still check the tone-arm balance though - I'm just curious as to what, if anything I could do about the balance if it was off anyway? It uses a non-user-adjustable spring to set the tracking force. You can check it with a gram scale and it should be at 3.5 grams, but 3.4 to 3.6 is acceptable. If it is outside that range, only getting in there and bending or stretching the spring somehow will help. You can download the service manual for your Denon model here. This could also be useful for AT LP60 owners. But that manual does not have any info about adjusting the tracking force. It does show how to remove the cartridge. Forum member @vwestlife has made a video with tips and hacks for another essentially similar turntable, an Aiwa branded version. You should find this interesting. It shows how to check the tracking force at 28:45.
vwestlife and Leonthepro like this. That is a lot of vtf... My current p mount tracks @ 1.5g, even though it's using a MicroLine stylus. Heck, my old .4x.7 Elliptical tracked well around 1.8-2.0g. It’s within spec for the cart though, setting less than recommended VTF is always the worst thing you can do as far as mistracking. P-mount carts were designed to conform to 1.5g VTF as a standard so that setting didn’t need to be adjusted by the user as they switched tables and carts within the system. These new cheap decks are similarity “pre calibrated” to the AT3600L as the only standard, just much less accurately. P-mounts are a great entry into the hobby, because they really nailed that balance of quality and ease of use. McLover and Leonthepro like this. 3.5 is not a record muncher. Better to do it too high than too little. That said, my old Rega Carbon cart is the exact same one as @vwestlife found out recently and I was tracking that one at 2 grams for a long time, because Rega said so. Never found anything wrong and not sure it had any negative effects. Id still recommend at least 3 grams for it though. It did mistrack on very tough records but I always assumed that to be because its a spherical stylus. The second is a Denon-DP200. Simple little table, no frills, and I'm not even sure Denon makes them (rebadges I assume?). When connected to any sort of amp (a Denon AVR-X500 for example) I hear muffled/raspy sound reproduction, but no tracking issues. I've replaced the stylus... identical issues. I've tried using another amp... same issue. If you're using an amp with a phono input, make sure you turn off the Denon's built-in pre-amp, otherwise you will get very muffled, distorted sound. There is a switch for it under the platter. Take off the platter mat and rotate the platter until one of the holes is facing towards the back. You should see an "Equalizer On/Off" switch hiding down in there. Make sure it is set to OFF when the turntable is connected to a phono input or ON when connected to a line-level (aux/CD/video/etc.) input. The FRiNgE, Leonthepro and zombiemodernist like this. Try disconnecting and reconnecting the cartridge connections to the arm a couple of times. It's a PITA on that table as the cartridge is integrated into the headshell. You have to carefully remove the headshell via a tiny screw underneath to expose the wiring. The Denon DP-200 and Audio Technica LP60 share the exact same parts from the Hanpin OEM factory and are well known for poor build quality and QC issues. Note that you cannot swap the cartridge to something better from Ortofon and other brands since it's built right into the tonearm, severely limiting the upgradability and having to fuss around the non-user friendly spring for tracking force. I would recommend ditching the DP-200 and go with something better. Cronverc, luckybaer, Leonthepro and 1 other person like this. This design has been around since 1993 with millions of units made. However, most of the people who own them don't normally seek out audio forums just to tell everyone how happy they are with it. They only come here if they have a problem and need help. Just as you probably don't seek out an appliance forum just to tell everyone that your Maytag washer is working fine and you're thrilled with it -- you'd only do so if you needed help with a problem. That is an advantage for a beginner turntable. That way the user does not have to worry about aligning the cartridge, balancing the tonearm, or setting the tracking force -- all things which take a fair amount of knowledge, skill, and patience to do correctly. Asking the typical teenager who buys one of these turntables to do this is a recipe for user error, frustration, and needless product returns. Having it all permanently set at the factory makes it much more foolproof and easy to set up. And even if it could accept a standard 1/2"-mount cartridge and had easily adjustable tracking force, would you really want to put a $100+ Ortofon cartridge on a $99 turntable? No, probably not... so you're complaining about the lack of an upgrade path that nobody would use even if it did exist. H8SLKC and andybeau like this. Honestly, I'm not in the camp that an LP-60 design is damaging LPs when it ships properly calibrated. For those alarmed at the VTF, I would note that placing the VTF at the higher end of the cart's range is compensating for the arm's lack of tracking ability. As for sound, the AT3600L is a decent starter cart, with a pretty pleasing tone especially for the price (clearly good enough for Rega as you discovered @vwestlife ). I've known several people who started with these tables, and they treated them well enough, but I've also heard a fair deal of issues they had with skipping and speed stability. From my perspective, the real problem here is in QC and reliability, which is why I agree with @nosliw that there are better options available on the used market for less than what these run new if OP has encountered a lemon. If the issue is not just the toggle switch being off, it could be an internal phono section failure, cart failure, power supply failure etc. At this point, I wouldn't invest in paying for repairs to this table. Not sure of the availability in OP's country, but I would advocate that a cheap Technics P-mount like an SL-BD22, or SL-DD22 serves the same purpose as the LP-60 in ease of use, lack of features to touch and understand. Plus, those models can take a huge variety of carts, from cheap ATs and Shures to higher end MCs. These can be found for $50USD in good shape, and at half the price of an LP-60, I think they're much better made as well as better sounding and upgradable. Of course, "get a new table" isn't the best thing to hear if you're just getting into a hobby, but having something that works well and is reliable is important as well. McLover, nosliw and Leonthepro like this. For those alarmed at the VTF, I would note that placing the VTF at the higher end of the cart's range is compensating for the arm's lack of tracking ability. If you're lucky -- and don't forget to factor in the cost of a new stylus, new belt, adding a pre-amp if your amp doesn't have a phono input, etc… At least around here in NJ, good used turntables that are substantially better than an AT-LP60 or its Sony/Denon/etc. equivalents just aren't that easy to find. Not sure of the availability in OP's country, but I would advocate that a cheap Technics P-mount like an SL-BD22, or SL-DD22 serves the same purpose as the LP-60 in ease of use, lack of features to touch and understand. Plus, those models can take a huge variety of carts, from cheap ATs and Shures to higher end MCs. These can be found for $50USD in good shape, and at half the price of an LP-60, I think they're much better made as well as better sounding and upgradable. There are some good P-Mount turntables, but the majority of them -- including the 1990s/2000s Technics you mention -- are just as cheap and plasticky as an AT-LP60 (see video below). In fact, the LP60 is based on a P-Mount turntable design dating back to 1986, but cost-reduced by permanently affixing an AT3600L to the end of the tonearm. And P-Mount cartridges that are really any better than an AT3600L haven't been in production in years, so you'll be searching for NOS examples to find any. H8SLKC and Leonthepro like this.